We have not yet tested all distributions (nor do we intend to! ), just the most commonly-used ones. Network manager is used by Ubuntu (and other linux distributions) to manage network connections. It provides a convenient and user-friendly method of configuring VPN connections. It's used by default by desktop environments like Gnome and KDE. (Different desktop environments have different interfaces, so the images below might not match your experience perfectly. The available options should be the same, though.) If you don't use Network Manager then have a look at our general Linux instructions instead of this page. Click on the 'Edit connections...' menu item to open the Network Connections screen. From the Network Connections screen click the 'Add' button. 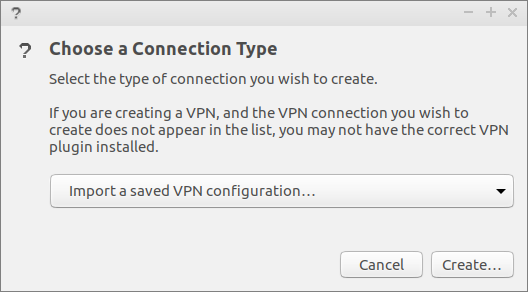 On some versions of Linux you may need to switch to a tab labelled 'VPN' first. Look through the list of network types offered. You may have an option to import a saved VPN connection. If you do, pick that one and use the config file here as the configuration to import. If you don't have an option to import a saved config you will have to set things up by hand. 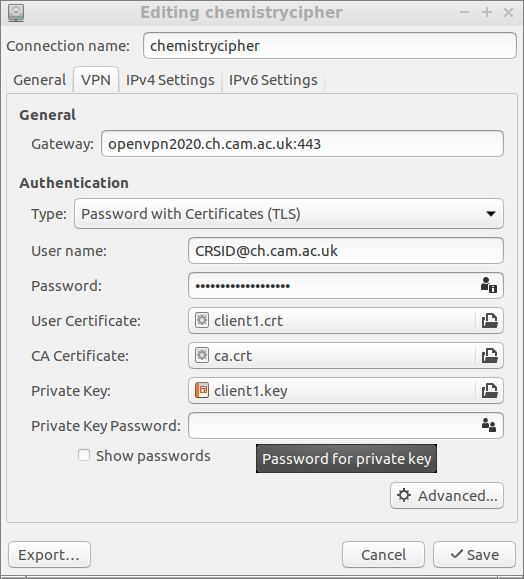 The type of VPN used by the Department of Chemistry is OpenVPN, so you should select that option. 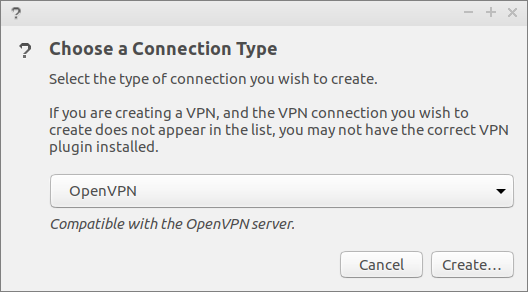 If you don't get an option to select that, you should install the OpenVPN module for network manager (in Ubuntu/Debian, the package is called 'network-manager-openvpn'. 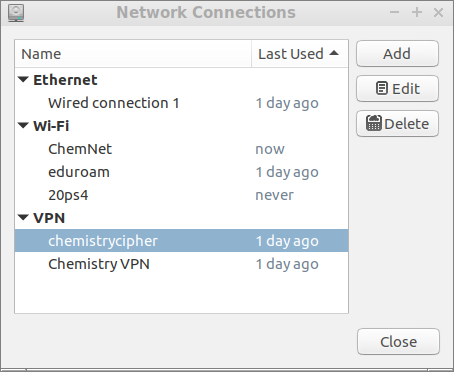 On some machines you'll also need to install 'network-manager-openvpn-gnome'. Note: if you install either of those packages, you will have the option to select OpenVPN immediately but you will need to reboot before anything works. Save some bother and reboot immediately after installing.). Private Key Password: Leave this blank! The TLS Authentication and Proxy tabs don't need to have any changes. Now you should be able to start the VPN by going to the Network Connections menu and selecting it from the available VPNs.